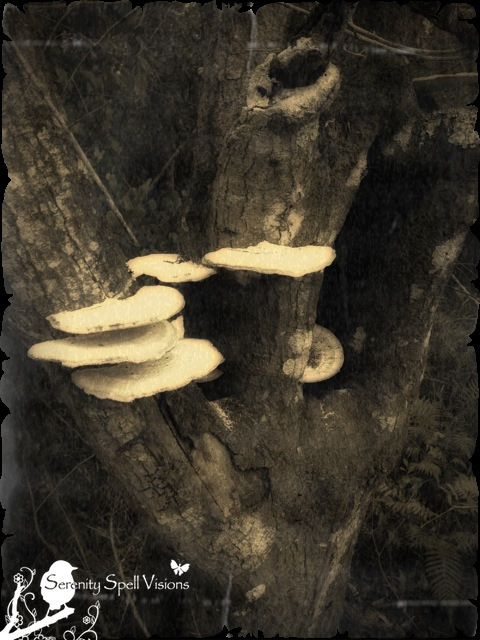 Walking the Malachite Trail in the SWA portion of the most wonderfully pristine Everglades watershed of the Grassy Waters Preserve, an old tree displayed new life with a whimsical fungi arrangement — a fairy staircase! Lovely words for the mushrooms. I loved the Everglades when I visited. Thanks much! There’s so much to see in the ‘Glades; such a fascinating and varied ecosystem that spreads so very far (far beyond the actual designated parks!)…. Love it! I was out taking pictures of black birds the other day near a huge patch of shamrocks that looked like an elemental’s garden but this is even better! Ah, how PERFECT!! I don’t know… I see such things everywhere. I tried to crawl into a swamp recently to shoot a fairy ring of shamrock, it was just sublime. Unfortunately I couldn’t…quite…reach it. 🙂 Not enough to get a good shot of it, anyways. I love your title on this one..especially after talking about Ida Outhwaite..so it would be easy to visualize one of her fairy drawings with this idea!! This scene really WOULD fit in with her work… Sigh. Visions of those traditional artists floating in my head. They really had such fantastic imaginations, and a true love and respect of the natural kingdom. Loving your captures – Cool:) Happy Tuesday! It does have magical qualities doesn’t it? It’s cool to hang out with a mushroom, he’s such a fungi. Okay, I know, I’m banned. Sorry. I always return from a visit to the woods or marsh and can’t believe I didn’t take any fungus images. They are so varied and beautiful. —->Note to self: do a fungus project. Awwww! I was going to see if anyone had done the old fungus amongus line, and there it is! You never disappoint! It is a wonderful photo of a truly unique arrangement. As with so much in life, it’s the details – and the imagination – that count! You’re exactly right — there’s SO much to see in life, especially in these wonderful, beautiful natural spaces. It sets the imagination free, which I truly believe is why it’s so imperative (well, one of the trillion reasons) to preserve them. Nice fairytale trees. Like the B&W very much..
Ah, thanks so much! I adore fairytale trees… I see them everywhere. 🙂 That first pic came from my little iPhone, crazy enough. And she’s climbing a stairway to heaven. Love, love, love it!! Did you come up with that name??? 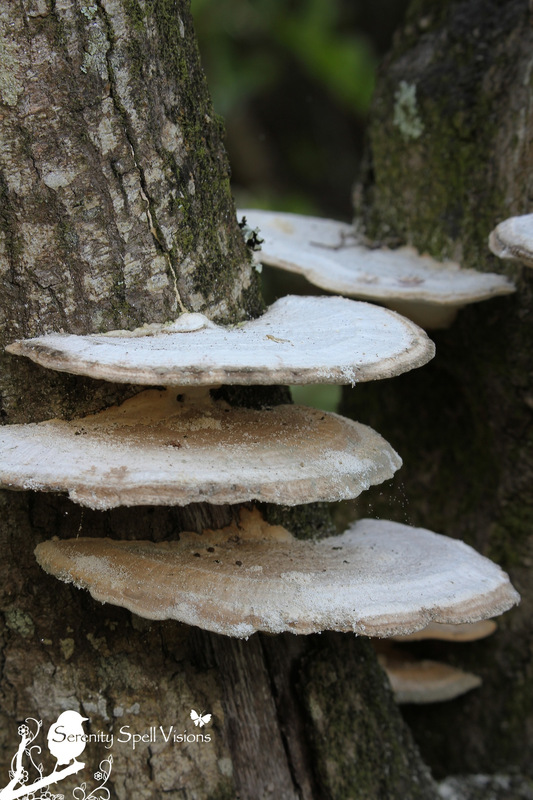 See this Wikipedia article on Polyporus squamosus. WOW… That’s so perfect. Utterly perfect. I just learned, from a fellow (Dutch) blogger artist friend, that those mushrooms I photographed are translated as “fairy couches” in her language. How sublime is that…. “Fairy couches” … very cool! I wouldn’t have guessed that fairies were a part of the Dutch folklore. Ah, there were some AMAZING fairy artists / authors from the likes of Norway, Sweden…. all those northern climes. Probably all intermingled at some point! I just ran into another fey name: Scarlet Elf Cup. Ooooooh I love, love, LOVE it! And they’re so incredibly LOVELY!